Facebook is in the process of rolling out a share button for its mobile site, a spokesperson for the company told TechRadar Wednesday, and has plans to expand. "We started rolling out a share button on the mobile site, and it will be coming to iOS and Android," the spokesperson said. No other details, like a specific time frame for the OS inclusion, were offered except the promise that the social network would get back in touch "when we have more information." Such a button has been missing from the site's mobile interface despite requests from users to add a clickable feature that would allow them to repost things like photos, links and statuses. Inside Facebook first spotted the arrival of the mobile share button, though initially reported it as a test. Now, with Facebook's confirmation, it looks as though the feature is here to stay. The development marks just one of several new features the site introduced Wednesday. First up was a Social Jobs Partnership app, which lets job seekers hunt for work through the site based on location, industry or skill, with all openings backed up by a handful of employment search services. Also on Facebook's agenda was the introduction of Pages Feeds, or news feeds free of friends (sorry, guys) and featuring posts from the pages users like. 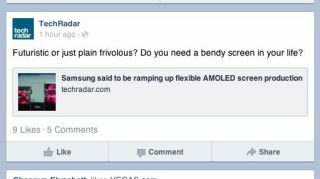 TechRadar will provide any and all information related to the new share button as soon as it becomes available.